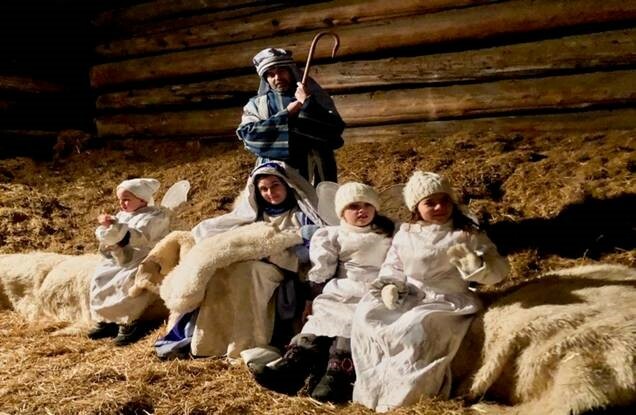 Welcome to "On the Way to Bethlehem"
“On the Way to Bethlehem” is an outdoor Christmas Nativity Pageant. Arriving anytime from 6:30 until 8:30 pm, visitors will enter the large reception area in Gambrel Barn, where they will enjoy the music of the mass choir. 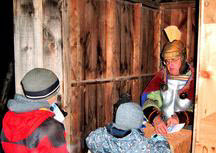 When ready, groups will travel the road to Bethlehem with a “guide.” On their 30–45 minute outdoor journey, visitors will witness King Herod’s court, interact with Roman soldiers, shepherds, magi, innkeepers and fellow travelers to reveal the Christmas story. At the end of their journey, visitors will follow a lamplight walkway to the refreshment area, where their "passports" will be stamped, and they can enjoy a warm drink and a cookie. When ready, they will be given a wagon ride to the exit. This is primarily an outdoor experience so it is important to dress warmly and wear comfortable walking shoes or boots. This DVD takes the viewer from the initial line-up to get into the Gambrel Barn, to the tractor ride back to the parking lot, while “stopping” at every location during the walk to the manger in the Bethlehem stable to see and hear the many people who were there (Roman Soldiers, King Herod, Shepherds, Mary, Joseph, and many more). See links to the right for videos (both long and short). To obtain your FREE copy, simply click the DONATE button and MAKE A DONATION OF $25 or more through our Canada Helps service. Please provide your personal information with your donation so we can send you your FREE DVD FOR DONATIONS OF $25 OR MORE. Admission payable at the gate – no advance purchase of tickets. CLICK HERE to send an email or phone 905-875-0839 to make special arrangements for groups. To watch the video of the last "On the Way to Bethlehem" Nativity Pageant on YouTube, please click here. DRESS WARMLY – your journey to Bethlehem is outdoors, and will last approximately 30 minutes. The weather at this time of year is always cold in the evening. Wear good walking shoes (or boots if there is snow), a warm and wind-proof coat, hat, and gloves or mittens. A hot drink and a cookie will be waiting for you when you complete your journey. If you would like to donate as a corporate or personal sponsor, CONTACT US to find out more. Clicking the button above will take you to the Canada Helps website where you can donate securely to support the ON THE WAY TO BETHLEHEM pageant. All donations will receive a charitable receipt. Please provide your personal information so that we can thank you for your gift.